All MCPS High School students may enroll at Thomas Edison High School in Automotive Technology or Automotive Body / Collision Repair easily. Just fill out an application and select which courses you want to take. Looking for a Guaranteed Tax Deduction? Donate your vehicle to Automotive Trades Foundation, Inc. (ATF), a non-profit foundation, for use by the students. Contact Mike Snyder at 240.740.2047. High school students are trained for skilled positions in the automotive field through the Mini Dealership, a licensed used car dealership. A list of available cars and information on the lottery drawing for vehicle purchase. The ATF is a nonprofit organization established cooperatively by the Montgomery County business and professional community and Montgomery County Public Schools to provide a unique method of training high school students for skilled positions in the automotive field: the Mini Dealership, a licensed used car dealership. Students receive valuable on-the-job training that will prepare them for higher educational opportunities or direct entry into the automotive industry. Check out the Automotive Trades Foundation video describing the automotive programs. Damascus Car Sale Receives Media Coverage! NEXT SALE: May 11, 2019Foundations Office @ Edison High School12501 Dalewood DriveSilver Spring, MD 209069 a.m. - 11:00 a.m.
Women in Automotive- A video from Fitzgerald Auto Mall showcasing opportunities for women in the automotive field. Join us for our refurbished car sales. 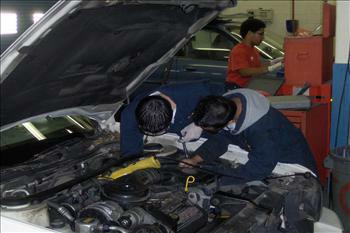 ATF students refurbish cars and then sell them to the public. All sales run from 9 a.m. - 11:00 a.m. Donate Your Vehicle and Receive a Tax Deduction! Herb Gordon Subaru Donates Vehicle to ATF! Check out the story and see the video. View photos and learn more. BG Products – Kasco Inc.